At LogistiCare, our mission is to empower passionate people to provide quality access to human and health care services through technology, innovation, and community partnerships while meeting commitments to our stakeholders. Our relationships with clients, members, and the community are the foundation of our business, and we treat every interaction, program, and ride with compassion, respect, and a human touch. 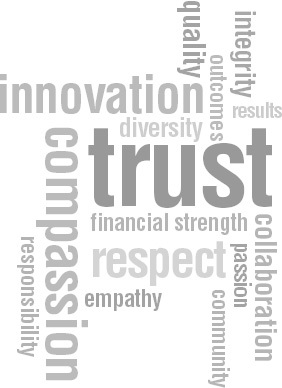 It’s the reason why more states trust us with their business and members than any other manager. We value our client relationships with a heightened sense of responsibility that makes LogistiCare the long-term vendor of choice. In fact, many clients turn to us after being left in a predicament by a vendor that can’t deliver on their word. We work diligently to take on those programs—often in 30 days—and to turn problems into results. From the partnerships we forge to the members we serve, our values guide our journey. Our work with clients and partners helps us deliver the care and service we’re known for. Putting members first is not just a slogan, it’s how we operate. From the critical transportation services we provide to appointments and preventive care, to the courageous efforts in transporting those in need during winter storms and other out-of-the-ordinary conditions, our wheels keep turning for our members. Innovative Technology: We use the latest fleet monitoring technology to gauge traffic flow and track our members’ rides before, during, and after pick up to help them get to their destinations as quickly and safely as possible. Stringent Oversight: Members can be assured that drivers and vehicles have undergone a strict credentialing process, including vehicle inspections, driver and attendant background checks and screening, and surprise field monitoring checks to assure our riders experience safe and reliable transportation at all times. “We Care” Service: At LogistiCare, every member matters. Providing quality service has been a hallmark of our business since its inception. Since then, we’ve serviced millions of specialized trips for members. We care about quality service — and we demand and deliver it with every call, every interaction, and every ride. If something isn’t going right, or if it’s going really well, please let us know. For the elderly, disabled, and frail who live at home and can no longer safely drive, one of the most vexing barriers to getting the care they need is transportation. The added worries about rides can take a toll on families. LogistiCare is committed to reducing that stress by taking that burden away and providing timely, reliable, compassionate service that gets members the care they need. For the children, parents, and healthy adults we serve, we understand that preventive care is crucial to spotting and resolving health issues before they cause long-term problems. We help these members keep up with preventative care by providing transportation they don’t have access to. Healthy children, parents, and adults make for a healthier community, which leads to a brighter future. LogistiCare is the largest non-emergency medical transportation manager in the country. We’re also the most flexible at customizing our services. We’re large enough to provide our clients with the security of a publically traded company, yet still nimble enough to ensure the programs we manage are tailored to our clients’ and members’ specific needs – and that our services, technology, and teams can scale up and down to meet demand. That’s what sets us apart. Unlike a family-run business or smaller private companies, we must remain compliant with Federal, State, and local regulations at all times. But complying isn’t enough. It’s our goal to go beyond. We have maintained our position as the industry’s leader in cost effective NEMT solutions by listening to the needs of our clients and their members, lining up business rules, remaining flexible – and changing and adapting accordingly as needed. Today’s healthcare landscape doesn’t allow for cookie-cutter approaches. On scale with Medicaid expansion, we’ve met the challenge of ramping up state programs by hundreds of thousands of members, while still understanding and accommodating the sometimes subtle variations among State Medicaid benefits. We’re customization experts. Want to know more? 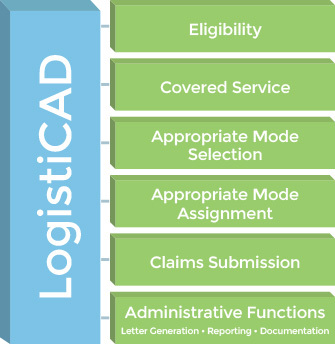 Learn how LogistiCare scaled to meet the needs of New York State’s Medicaid transportation management contract. There is no shortage of companies that focus on technology for technology’s sake. That’s not LogistiCare. We approach innovation and emerging technologies from a client and member perspective and carefully align our innovative programs and technologies with their unique needs. 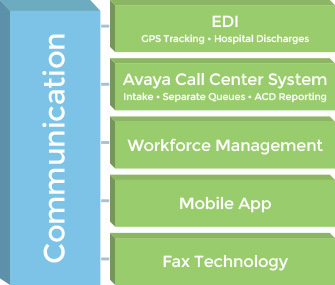 Our technology platform supports everything we do, from eligibility to claims submission, and is the integration hub that combines both transportation management and communications functionality. LogistiCare’s platform, LogistiCAD®, is a private cloud‐based solution that provides flexibility and scalability. The flexibility of our platform allows us to take the State’s contract requirements and approved policies and procedures, translate them into business rules, and enter them into our system’s business rules engine. Our flexible platform automates processes and creates efficiency and consistency in program delivery and contract compliance.